While springer season has ended in much of the Northwest, where I fish it’s just begun. The Salmon River near Riggins, Idaho, is kind of special because every five years we get a real late run of spring Chinook and that late run is taking place now. The reason we get a late run here is blamed on The Slide, a special rapid that many credit as being the largest in the Northwest. It’s huge rapid. A monster. At low water there’s no rapid, but right now it’s at 50,000 cfs and the fish won’t come through when there’s this much water. It’s like a natural roadblock, so big and turbulent the salmon clog up below it. Fortunately, they’ll come upriver as we get below 40,000-50,000 cfs, which is happening now. Another factor is water temperature. If the water temperature is cooler than 50 they wont come up. They’ll hold in the Snake River. Right now our water is about 53 degrees, which is what we want for salmon fishing. Falling water is bringing our cfs down which is telling me that a huge wave of fish will be coming in for the next 10 days. For the next two weeks it’s going to be dynamite here. Fish and Game gave us a 5,000 fish quota this year (up from roughly 1,800 last year) and I’m guessing the majority of those fish will be caught in the next two weeks. Reason being is the water level has come down and is forecasted to keep dropping. 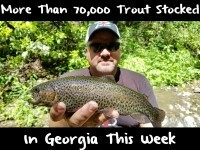 We’ll have good numbers of fish running by us until July. Spring salmon just started showing Thursday in the Riggins area. The only section of river that’s open right now is Rice Creek Grade to Riggins, roughly a 36-mile section of the Salmon River. Personally, I’ve been in the Twin Bridges area, but I’ll be heading down in The Green Canyon section this week. It’s important to have an assortment of baits with you. Most of us use three standard offerings. I’ve been running sardine wrapped plugs soaked in red Pautzke Nectar and Fire Power. I also drag full size chartreuse Fire Brine herring and a Spin N Glow and red Fire Cure eggs on a diver. Normally, the early morning bite comes on plugs. Eggs are better in the afternoon. Keep in mind, right now we contend with high water. We have logs floating down the river and it’s off colored. Any chrome and yellow colors have been fishing real good. As the water clears up I’ll go to the silver and blue patterns, however. And, as the water drops it clears up. The creeks will stop throwing mud into the system and we’ll clear daily. If you are a bank angler the plunking should be good too. 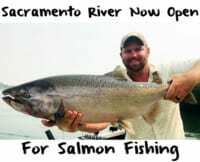 You have to find a spot where there are no willows in front of you, but with the number of salmon coming through bank anglers will catch their share, too. Editor’s Note: On the Salmon River in Idaho anglers may keep two adult salmon and two jacks. However, if you catch your adults and keep them you have to stop fishing. Homer Brown guides for Killgore Adventures. 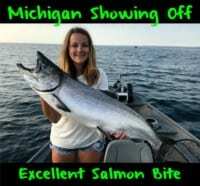 For more info on his Salmon River springer trips please visit http://killgoreadventures.com/.